…and gets ready for September 21 collaboration! 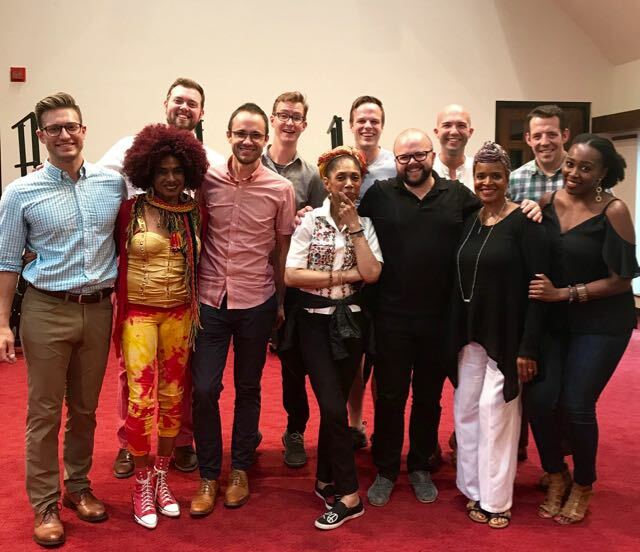 It’s been official for a couple of months now that Cantus has the honor of hosting Sweet Honey in the Rock at Orchestra Hall in Minneapolis and today that collaboration became a lot more tangible. Early on in our conversations with Sweet Honey about the joint performance on September 21st we realized that we would both be performing on consecutive nights in Pella, IA, for the Iowa Choral Director’s Association conference. It obviously presented a great opportunity for us to get to know each other, talk repertoire, and discuss how the show could be most effectively structured. Our host at ICDA, Sarah Bouska, was extremely helpful in helping us to find time and reserving space at the Central College chapel for a meeting. Here’s a little context on how this collaboration came to be. Over the years Cantus has been inspired by Sweet Honey’s music and programming. We’ve performed some of their standards (‘Wanting Memories’, ‘Would You Harbor Me’, ‘I Remember, I Believe’), commissioned one of their former members, Ysaye Barnwell, and admired their strong artistic commitment to their values and social justice mission. There is also symmetry and synergy with Cantus’ mission to give voice to human experience. The meeting itself could not have been more invigorating. Speaking from Cantus side, we had some jitters knowing these artistically formidable ladies were about to walk through the chapel doors and we had very few expectations of what the meeting would actually look like. Our jitters were quickly put to rest. Carol, Aisha, Rochelle, and Nitanju could not have been more gracious from the first moment they walked in. We had a blast each sharing some of our music with each other, and it was incredible to hear them live, a cappella, and from a six feet away. Make no mistake, these women can sing! And every word and note they sing is imbued with emotion and meaning. A personal highlight for me was hearing them perform ‘The Living Waters’ with lead vocals and composition by Aisha Kahlil. It’s an absolutely breathtaking piece, and it may be one that we get to perform together! The time flew, but we had a chance to sing ‘Would You Harbor Me’ together and also do an improv before we said our goodbyes. September 21, 2017 is going to be an unforgettable evening of fellowship and performance. For tickets or more information, click here. Or call: 612.371.5656.